This dish is a combination of spice shocks together with salt shocks, both very strong tastes! You should eat it with plain rice to soften the flavours. 1. Slice the eggs into halves, take the spoon and scoop out the egg from the shell – it’s the easiest way to remove the shells. 2. Put the garlic and bird chilies into the blender and blend to a fine mix. Add the fish sauce, lemon juice and chopped coriander and mix together. 3. Place the eggs onto a serving plate, slice the onions and put them on top, then spoon the chilli mixture over the eggs. 4. Garnish with a few sprigs of mint. Hello fellow readers and welcome to thaifood-recipe.com, the website where you can learn how to make Thai food. I have been living in Thailand for a couple of years and I really adore their kitchen and of course learned how to prepare some Thailand food dishes. Thai food is pretty simple to prepare, so please, do not be afraid to try. 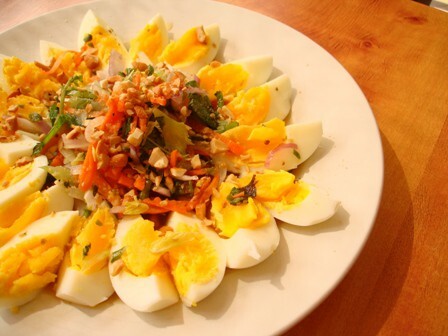 I have collected easy Thai food recipes that you can prepare at home. Feel free to browse through my blog and find the simplest Thai food recipes that can be easily made at home.